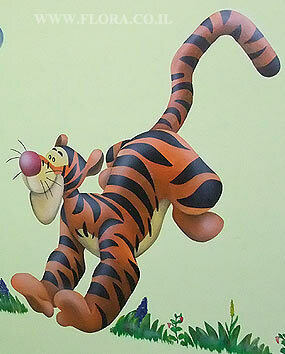 FLORA - MURALS - KINDERGARTEN MURALS - NURSERY YALDUTI - WALL PAINTINGS - TIGGER AND PIGLET FROM WINNIE THE POOH STORY. Wall paintings - nursery baby rooms. Painting Tigger and Piglet from Winnie the Pooh story. Location: Nursery Yalduti in Ashkelon.